I was asked to relate a recent experience Bob and I had. 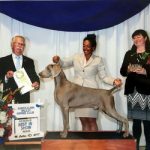 As many of you know, long time breeder and Weimaraner lover Joan Valdez suddenly lost her sight. We have known Joan for 38 years. 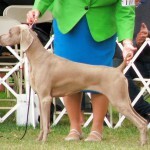 Joan has been breeding top winning Weimaraners since the 1960s (don’t’ believe me? Look in your pedigrees and I’m pretty sure you will see at least 1 Valmar dog and that dog will be a Bench Champion, and possibly even a Dual Champion). Her list of accomplishments in the breed are numerous and too many to list here. Over the years we became close friends and for the last 20+ years we have co-bred some litters with Joan under her kennel name “Valmar”. We watched her grade 100s of puppies during these years (some of her breeding, some with nothing to do with Valmar, some not even Weimaraners), we watched, asked questions and learned. Eventually we began breeding under our own kennel name. We recently had a litter of 1. This was going to be the first time we had a litter that Joan wasn’t going to be able to “see”. At some point we started to realize this little puppy was nice…very nice (sure she has faults and flaws, but every one does). We really wanted an opinion that we valued, someone that has graded more puppies of different breeds than we will ever be able to. 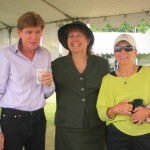 I contacted Joan and asked if we could bring this little thing up to her for her to “look at”. In typical Joan fashion, she replied “I can’t see!”. Yup, I said, you can’t see with your eyes, but I’ve watched you grade 100s of puppies and watched your hands and your face, you my friend see more with your hands than most of us will ever realize with our eyes. 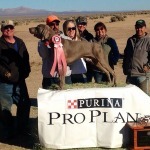 We contacted another mutual friend and successful breeder of Weims, and Bouviers, Terry Burian-Creel. Terry agreed to also meet up at Joan’s. So when little Ms Stinklefits was 8 weeks old off we went. Brought the grooming table in, Terry stacked, Joan began examining with her hands. And just as we suspected, she “saw” things, made comments, pointed out things both positive and negative about this puppy. After a bit, puppy tired of this and needed to get down and let off some steam which she did. After a bit she came back to Joan, tried to climb up and bite her. Joan reached down plucked her up, gave her a firm puppy correction for biting, puppy promptly laid down and fell asleep snuggled up next to Joan (I wish I would have gotten a picture of this). The next few hours were spent talking dogs and pedigrees.. Dogs we all knew or had seen first-hand but knew in different contexts. No bashing, no one was right or wrong, just frank, honest discussion about the dogs, not just structure, but also personalities, quirks, strengths and weaknesses. It was a fun, wonderful afternoon/evening, and I want to thank these two amazing breeders/friends who have a passion about the breed and about breeding dogs in general. The point of this story? Well, breeding dogs is not a science you can learn from reading a book. Grading a litter or a single puppy isn’t about stroking an ego or determining the “Pick Puppy”. It’s the experience and knowledge from those experiences exchanged that is more valuable than any book or FaceBook post you might read. No matter how long you’ve been breeding or how much success you have had or what you think you know about this breed there is always someone who has valuable knowledge and insight they will happily share with you. 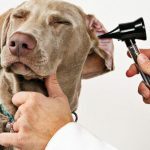 Breeders and others that knew or have seen many of the dogs in your dog’s pedigree that have first hand knowledge of these dogs should not be ignored. You would be wise to seek them out, ask questions and be willing to listen and learn from their first hand experiences.